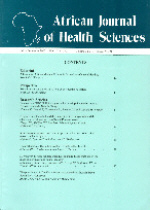 The African Journal of Health Sciences published by the African Forum for Health Sciences, is now the fastest growing medical journal in the continent with a wide readership within and outside Africa. The journal is dedicated to primarily serve scientists in Africa. It accepts contributions from colleagues based anywhere globally who wish to contribute to health b y communication research findings, news and views on salient health challenges.